Introductory Chemistry was developed to take advantage of a digital environment within Sapling Learning to create a more visual, interactive experience for students learning introductory chemistry and to provide a wealth of resources to support various teaching styles. Both the print and digital resources were designed from the ground up and in parallel to create a flexible teaching and learning experience. Kevin Revell understands the student audience and knows how to draw them in with an accessible narrative. 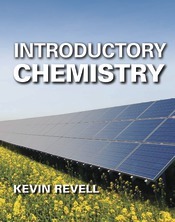 By using simple, straightforward language, Revell presents Introductory Chemistry in a way that is welcoming and attainable for all students. Throughout both the text and digital tools, material is broken into achievable steps and students are given the support, guidance and reinforcement necessary to successfully learn Introductory Chemistry concepts. Introductory Chemistry introduces students to chemistry with a uniquely engaging writing style that not only promotes understanding but uses devices like storytelling and analogies to also help students learn at a deeper level and retain concepts. Interactive activities give students a way to work through online tutorials for targeted, hands-on practice with the most difficult concepts in the course and provide a foundation for conceptual understanding and problem solving skills. Moving from comprehension to retention, students solidify their understanding of material to the point where they just " know it". This in turn helps build on concepts as they move forward through the course and continue to grow their ability to solve more complex problems. Written and developed as an integrated print and digital resource, Introductory Chemistry was designed to serve as a teaching and learning tool to meet instructors and students where they are today and provide support and tools tailored to various teaching styles. Instructors interested in incorporating active learning into their classrooms will find resources to make this an easy transition. Those who already subscribe to active learning techniques will find tools to complement their efforts. Students will also find support for diverse learning styles and can take advantage of learning through the printed narrative and pedagogy, eBook and interactive digital tools, or a combination of both. Students can choose to access the content in the learning environment that best fits their needs: the printed narrative and pedagogy, the eBook and interactive digital tools, the video lecture modules, or a combination. The content and approach of each environment includes the full Introductory Chemistry experience.